When Can Tea cause Tooth Loss? When it comes to eating anything, moderation is key. 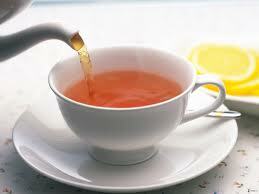 Here is an article from the Huffington Post which shows that over-consusmption of tea, can actually cause tooth loss. Decades of hard tea drinking led to tooth loss and other bone problems for a 47-year-old Michigan woman, reports the New England Journal of Medicine. After treating the patient for severe pain in her back, arms, legs and hips, her doctor Sudhaker Rao discovered that consuming “astronomical amounts” of highly concentrated tea for nearly 20 years had caused her fluoride levels to spike to more than four times the normal amount. As a result, her bones had become so brittle that her teeth had to be extracted. “Her bone density was very high, seven times denser than normal,” says Rao, “it was like steel.” In the US, brewed tea contains hight amounts of fluoride, which Rao believes was causing her bone problems. “There have been about three to four cases reported in the US associated with ingesting tea, especially large amounts of it,” he notes. The patient had been downing a pitcher of tea–containing roughly 20 milligrams of fluoride–a day. “Most of us can excrete fluoride extremely well, but if you drink too much, it can be a problem,” he says.